This is just some sample code I put together for somebody asking how to post customer payment line(s) using LedgerJournalEngine* classes. LedgerJournalEngine* classes are mostly used by the forms to do work and execute code before/after events and datasource actions. It may make more sense to just complete all of the LedgerJournalTrans fields, but using the engine can't really hurt and might be more helpful in some cases. I often see developers reinventing the wheel or using copy/paste code to send emails from X++, when Microsoft has included a very robust emailing framework to use. It's especially important to use once you start growing and sending many emails. This is article is focused on AX 2009, but I'd like to think it applies to AX 2012. 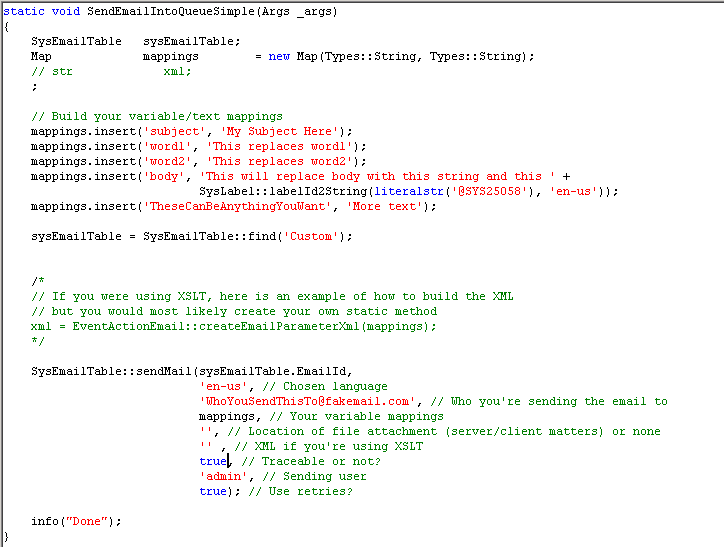 Templates - You can setup HTML or XSLT templates where you pass arguments that are plugged into the subject/body. Developers can stay concerned with technical aspects and leave the look of the email to functional users. 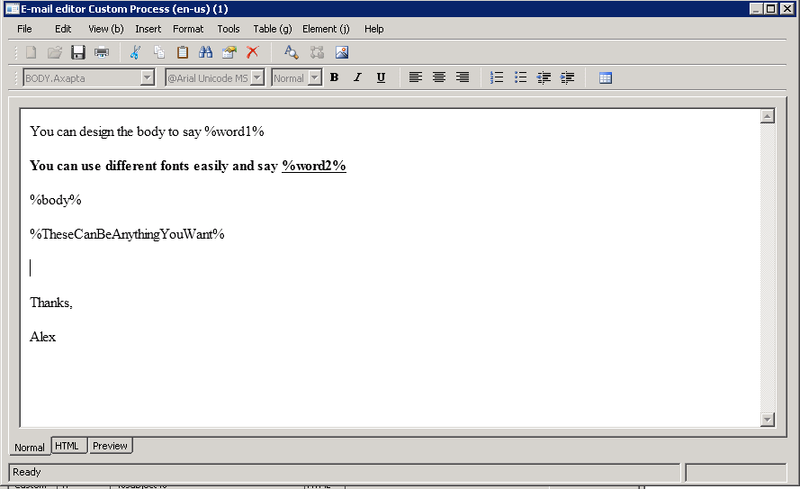 There is also a 'pretty' editor if functional users don't want to learn HTML. Take note of the General tab at the top, where you can set a senders priority and batch group. If you are frequently changing email priority from the same sender, you can just create "Sender" and "SenderHigh" for example, then switch between those two. 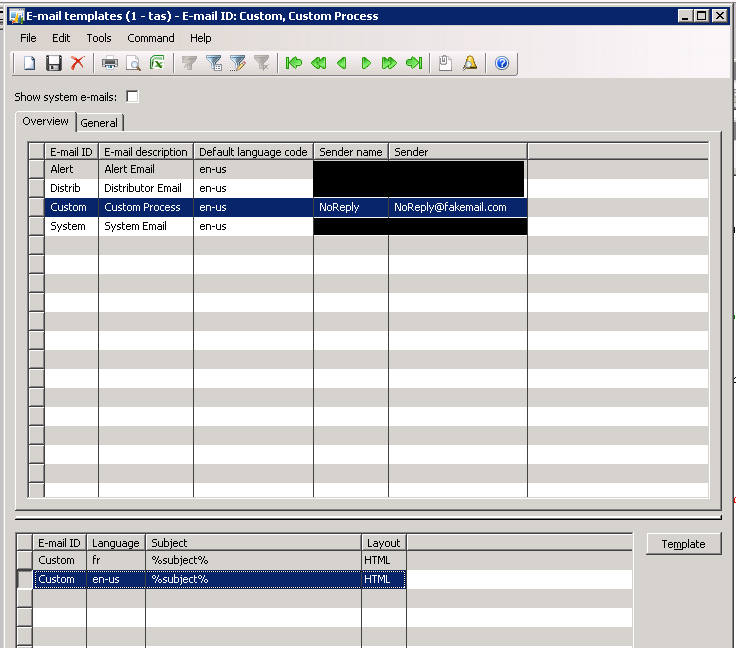 The bottom section is where you can create the actual email templates for the different languages. In the subject, you can put a default subject, or a custom replaceable "variable" such as %subject% or %AnythingYouWant%. There are two available layouts, HTML and XSLT. I will be working with HTML, but I will comment on XSLT. After clicking "Template", you see where you actually type up the email template you want to use. The variables need to start and end with the % sign, and they can be anything you want. Once these basic setups are done, the code is easy and very re-usable. 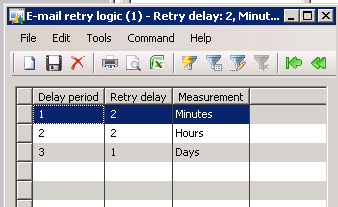 One thing to note about the "traceable" parameter is that when you set it to false, one of two things will happen. If your email sender has a batch group, then it will create a batch job and immediately execute, or it will just immediately send the email if it does not. true, // Traceable or not? 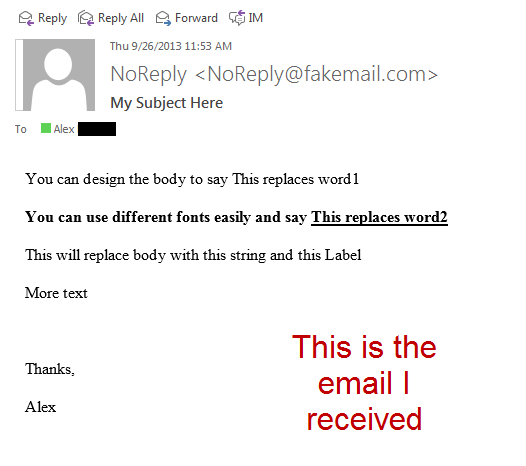 This is the actual email I received, where you can see the substitutions were done. Hopefully, this post will be informative, and if I left anything out, please comment. Happy DAX'ing!